Yep. “Wizard”. Can’t you tell? Over the past few years Tolkien’s work has come up several times in relation to Eclipse d20. That’s no surprise really; Tolkien’s works – most notable The Hobbit, The Lord of the Rings, and the Silmarillion – are deeply entangled in the foundations of fantasy gaming. Thus we’ve had Eclipse conversions for the Fellowship of the Ring, for the Charms and Talismans of the Rings, for Gandalf and the Balrog, for the Silmarils, and even for Morgoth and Sauron – albeit as Identities (temporary roles that you can drop into while visiting that dimension) for the Manifold Campaign. Guidelines for converting literary characters for RPG’s can be found HERE – and here is Darth Vader for another example. Now, occasionally someone objects – and anyone who puts in a large objection gets a large answer. Here’s the latest from Jeremy, in reply to the Gandalf and the Balrog post. As always, I’ll be going through the entire thing bit by bit in order. -The idea of a level 8 balrog is pretty shocking, and based on a trainwreck of false assumptions. Now, I quite understand the desire to make your favorite characters high level. What I suspect you’re missing is that Tolkien set his tale against a fairly realistic background; Most of his characters were level zero or one. World-class experts were level two or three. An eighth level character was, in comparison and in the setting, of incredibly high level. For a discussion of that, try the Converting Literary Characters link. He’s an Istari. They don’t bear ANY resemblance to D&D wizards, other than a handful of spell effects (all of which are used as spell-like abilities, with no hint of him having learned them at Hogwarts); they have a similar name, and that is where the resemblance begins and ends. Except, of course, that Tolkien’s work was among the inspirations for the original game – which led to a dispute with the Tolkien estate over the inclusion of Hobbits, Ents, extremely recognizable Rangers, Gandalf’s stunt with the flaming acorns, and a variety of other intellectual properties. The Tolkien Estate forced TSR to change a lot of names. In fact, we can quote one segment from an interview with Gygax that mentioned the topic… (The full interview can be found at theonering.net). (Gary Gygax) “Oh-oh! I am going to be in trouble from the get-go! I loved THE HOBBIT, read it once to myself, then about three or four times aloud to my children. As a Swords & Sorcery novel fan from way back–I read my first Conan yarn about 1948, was a fan and collector of the pulp SF and fantasy magazines since 1950, I was not as enamored of The Trilogy as were most of my contemporaries. While I loved Bombadil, the Nazgul too, the story was too slow-paced for me. How did it influence the D&D game? Whoa, plenty, of course. Just about all the players were huge JRRT fans, and so they insisted that I put as much Tolkien-influence material into the game as possible. Anyone reading this that recalls the original D&D game will know that there were Balrogs, Ents, and Hobbits in it. Later those were removed, and new, non-JRRT things substituted–Balor demons, Treants, and Halflings. So that tells us where the relationship begins. Lets compare. Tolkien’s Istari studied differing fields of magic (EG: such as Sauroman studing the Rings of Power, The Silmarillion page 362), and learned things about them. They used components and tools (acorns, existing fires, staves, words of power) in working their magic. They could not work without components – as per Gandalf’s being unable to burn snow. A spell-like ability has no verbal, somatic, or material component, nor does it require a focus or have an XP cost. The user activates it mentally. Ah. There we have it. Tolkien’s “wizards” may have had some spell-like abilities, but many of their magical powers were definitely not spell-like abilities. Lets see about the “resemblance”… Tolkien’s “Wizards” were old, they were scholars of magic and other lore, they learned new things about magic, they invoked magic through words and components, and they had a limited reserve of magical power (thus we have Gandalf being fatigued after using a Word of Power to try and hold a door closed against the Balrog). Yep. Sounds like a pretty throughly stereotypical “Wizard” to me – and that’s a stereotype that goes back LONG before Gygax OR Tolkien. Or to say that Keebler elves and Santa’s elves are obviously the exact same thing as D&D elves. Ah, a classic (and totally irrelevant) strawman argument. I generally don’t find it necessary to invent silly statements and try to assign them to someone with an opposing viewpoint. I also decline to engage in partial quoting out of context. That’s why your complete post is quoted in this answer, with each piece in order, and with each item answered. I mean, rating an angelic being who fights with a sword on his coincidental similarity to a D&D mage (who are not known for being physically supernatural immortal beings or for using swords)? Really? Lets see now… the article doesn’t rate anything except his spellcasting in comparison to a mage. Instead it evaluates all of his displayed abilities, including his swordfighting – but by d20 standards there’s no avoiding the fact that his magic was not so good. Sauroman trapped Gandalf by locking him on a rooftop. Evidently Gandalf had no Gate, Teleport, Fly, or even Feather Fall spell. He couldn’t conjure himself a rope. He couldn’t polymorph himself and fly away. Instead, when he had urgent things to do, he… waited around until he could talk a giant eagle into giving him a lift. Now that’s clever, and evocative, and a wonderful bit of fantasy – but in d20 terms it says that he wasn’t all that much of a spellcaster. As far as using a sword goes… plenty of D&D wizards used swords, even in first edition. Even if you didn’t dual or multi-class, if you found a really good sword it was well worth taking that -4 non-proficiency penalty. “Longevity” (fairly easy to achieve) is not at all the same as “immortality” (which Gandalf quite obviously did not have – except as every spirit had it). Rating all of Gandalf’s abilities on his vague coincidental similarity to a D&D spellcaster would be like watching Equilibrium and declaring that Cleric John Preston must be a low level cleric, since he never casts spells, or watching a movie about Batman and concluding that since bats have 1 hit dice, and that he is called Batman and not Dire Batman, he must be a level 1 character. Ah, more strawmen. First up, we’ve already disposed of that “coincidence” theory. Far more importantly, this also demonstrates rather neatly that you either didn’t bother to actually read the article you’re complaining about or that you didn’t understand it – or you’d have noticed that this is an Eclipse Classless writeup (not a Wizard) that does quite well with a sword and is using druidical or clerical magic with a modified spell list – which is a far better match to the abilities Gandalf actually displayed in the books. That’s the result of cataloging the abilities Gandalf displayed in the original source material. He would indeed make a lousy d20 wizard – which is why he has not been built as one. Are there any abilities which have been left out? You’re quite welcome to provide the relevant quote and page number (those vary between editions, but are often helpful in locating the right section anyway). You’re actually inadvertently correct on the next bit! “Cleric John Preston” has no “Cleric Levels”. What he calls himself is quite irrelevant; he’s not a spellcaster, he’s living in a world with no apparent magic, and he pretty certainly can’t channel positive energy to turn the undead. He’s not a d20 Cleric, he’d be a modern-setting d20 combat oriented character. Perhaps sadly, buying all the abilities that Gandalf displayed in the source material only required eight levels worth of character points. It’s not that the character was “rated at level eight”. It’s that building a character who could do everything that Gandalf could do only required eight levels worth of points. Arguing about classes is irrelevant. The bit about Batman… is derived entirely from your notion that the name given to something is important and the strawman argument that I should think it is. Here’s a hint; I don’t think that what you label something changes what it is. I know a car mechanic named “Jesus” (spanish spelling, and not uncommon). Does that mean that I should assume that he repairs engines by calling for miracles? We also know that Gandalf was definitely holding back whenever he was using magic near a human, at any rate. Although the motive Istari have for holding back is different, even in D&D, a high level character would likely let his companions fight their own battles whenever possible, just like Gandalf — for one thing, they’d need the XP more than him, and for another, that draws a lot of attention. I fear that all I can recall along those lines is a statement that the Istari were not permitted to oppose Sauron power to power. Can you actually provide a quote and a page number where it says that Gandalf didn’t use his full power against Sauroman’s army? Or the dweller in the pool? Or the Witch-King? Or, for that matter, the Balrog? His evidence that balrogs are only level 8? He neglects to mention that at least two of these elven heroes were appropriate challengers to a being that is definitely on par with a Physical God of Greek myth (and Valar definitely seem to fulfill the exact role that the usual godly pantheon in other “campaigns” do), Morgoth, who could do things like will entire volcanic mountain ranges into being (to use as his FENCE) and whose blows hit so hard that they shattered the earth right down to the MAGMA below. Seriously, what kind of damage is that? If any level 15 character you know can make entire volcanic mountain ranges spring up, please, link me to your character build. If any power attacker before level 20 can shatter the earth on a MISS right down to the lava, please, link em to your character build. Ah, here you are missing a few things. Morgoth started off as the second most powerful entity in the cosmos – right after Tolkien’s stand-in for “Omnipotent Creator”. In the beginning, Melkor alone was a match for most of the Vala put together. Fortunately for our heroic elves, in Tolkien’s writings, evil inevitably decayed and weakened. Arien was a Maia. Of course, the Balrogs were also Maia. Morgoth was afraid of a minor member of a host that he once opposed singlehanded. Hm. I don’t actually see anything there about magma or cracking the planetary crust. Even discounting the possibility that Grond is a +1 Flaming Hammer with some odd special ability that tries to drop it’s target into an instant pit (or better, which is very likely; it is a quasi-deities primary weapon after all), have you ever tried making fire with flint and steel? If you strike a massive metal object against earth and stone hard enough you’ll get smoke, sparks, and even fire if there’s anything at all to burn (such as grass or dry dirt with some organic content) or if you hit hard enough to reduce some rock to a molten state. Just as importantly, evidently the “mighty pit” was not so large that Fingolfin couldn’t leap aside – and we know that Fingolfin didn’t have any super-leaping powers or he wouldn’t have had to walk the rest of the time. So; Morgoth’s blows were not up to impacts like the one that formed Meteor Crater – and that impact did not punch through the planetary crust, although it created plenty of magma as kinetic energy transformed to heat. Of course, if it had punched through the planetary crust there would (after some delay for travel time) have been a full-scale explosive volcanic eruption covering miles – which isn’t mentioned. As for character builds that can do silly amounts of damage or make mountain ranges at low level… Try googling “Pun-Pun” or “Hulking Hurler” or any of dozens of other optimized builds. In fact it’s harder to do that sort of thing in Eclipse than in basic d20 – but you can. There are some examples (including the powers you need to purchase to be Morgoth) up on the site here. Of course, Fingolfin was NOT an “appropriate challenger”. He lost. Badly. He did do some points of damage – but there’s no indication that the wounds he inflicted were more than painful annoyances, and he got pulverized when he got hit. All this is telling us is that – in melee – Morgoth had a powerful weapon and bad aim. That’s not too surprising since he wasn’t a melee combatant and (in Eclipse) probably never bought any base attack bonus. Your entire argument thus comes down to “I think these two elves must have been high level”. You think that because they fought Melkor/Morgoth and did some damage before being pulverized. Lets see… fifth or sixth level combat character in melee against a noncombat fifteenth level character. Yep. That’s about the outcome I’d expect. Lets check reality; Look at olympic records versus physical DC ratings. Look at the difficulty of doing original research. Almost everyone who has ever lived can be accurately represented in d20 at or below level three. There might be a few who’d require level four – but I wouldn’t count on it. Level six is literally superhuman. In addition, he says “they were lesser foes than dragons,” a statement not well represented by the lore. There were dragons more powerful than the typical balor, but the reverse is also true. Ah, by “The Lore”. Lets take a quick look at the Silmarillion then. That is, after all, the only place where we’ll find information to compare lots of Dragons and Balrogs. Page 229: Here we have Balrogs and Dragons both on the field. Glaurung split two elvish armies – and it’s noted that, if it hadn’t been for the intervention of the dwarves (who managed to wound Glaurung) the dragons would have exterminated the Noldor. At that same battle it took Gothmog, Lord of Balrogs, and another Balrog attacking from behind, to take down King Fingon. Hm. Group of dragons versus two elvish armies – including Fingon. Elves need rescue – but it takes two Balrogs, including probably the most powerful one ever, to take down Fingon on his own. Page 291: Balrogs and Dragons at the fall of Gondolin. Gothmog Lord of Balrogs and the Elven King kill each other. Dragons destroy the city. Page 292: Glorfindel and a Balrog both die in a fight and a fall from a height. Page 302: The War of Wrath. The Host of the Valar annihilates the Balrogs in a single line – “The Balrogs were destroyed, save some few that fled and hid”. The Dragons are then unleashed, and the Host of the Valar – which just casually destroyed the Balrogs – is driven back. There is battle in the air “all the day and through a dark night of doubt”. The hosts of the Valar prevailed only with the rising of the sun. That’s the last appearance of Balrogs in the book. Dragons, however, are mentioned several times more. Evidently quite a few got away and didn’t need to hide. I really can’t find anything that says that Balrogs are really in the same class as Dragons. Could “The Lore” perhaps provide a page number and reference? Basically the argument in this complaint is entirely circular; “I’m sure that some of these characters were high level, so the others must also have been of high level!”. Well, I agree; they were – at levels five to eight – of fabulously high level for a realistic world. In magic-rich worlds, where incredible superhuman abilities are all too common, they really wouldn’t stand out much. 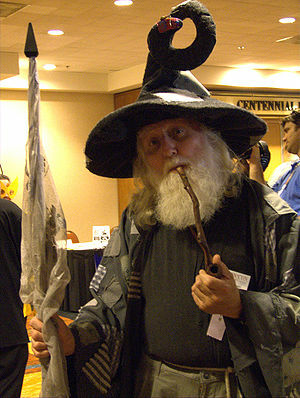 Have you ever read Dragon Magazine #5, pg 27, “Gandalf was only a 5th Level Magic-User by Bill Seligman? Oh yes – Dragon #5 is still down on the shelves in the basement – but it’s not really very closely related (besides being just a bit tongue-in-cheek). It’s still quite correct as far as it goes for that edition – Gandalf just doesn’t use any high-level spells – but it didn’t consider the other abilities he displayed. Of course, in most editions before Skills and Powers came out there really isn’t a good way to translate unique characters anyway. Thus the “What abilities did he actually display” approach. Of course, that ALWAYS disappoints fans; they like to speculate on what other abilities a character might have. It has nothing to do with liking Gandalf (he’s a decent chap, I suppose) and everything to do with wanting a little internal consistency as to your standards of comparison, not to mention that it irritates me every time people attempt to pave over the fact that Istari are spirit beings incarnated in flesh whose powers stem from their pre-biological existence, and not being actual old humans who learned their magic. Whenever people just jump right in and make that completely unjustifiable comparison, it annoys me, especially when people try to spread that idea, like you — and the actual net effect is people start thinking its true. The result of this mistaken line of thought (which you did not start, only perpetuate) is stuff like how I walk into a gaming store, open up a copy of MERP, full of hope, and find that it says “Oh yeah, the Istari opened up wizarding schools, so humans can learn magic too!” You go in expecting that a “Middle Earth Roleplaying Game” has some sort of accuracy instead of being a shameless D&D clone, and instead, you get the same old Harry Potter style wizards. Obviously, you didn’t start the fire, and its not your fault MERP was based more off D&D than Tolkien, and so I don’t blame you for these mistakes either. Yup, distinctly unlike AD&D and D&D equivalents. And please don’t cite Elminister or Dumbledore — “human guy who learned magic and is now old” doesn’t even vaguely resemble “spirit who took the form of an old man.” There’s art of geezery wizards, which proves primarily that the artists for it, like most D&D fans, had the mental conception of wizards = Gandalf, but its vanishingly unlikely for any wizard PC to be old. Their starting age is going to be in their 20s and 30s — and there isn’t really an opportunity to go beyond that, 99% of the time. When there is, you will have old wizards alongside old party members in general. Yeah, but what makes D&D wizards distinct is that they verifiably learn new magic and add to their repertoire. I don’t think its at all clear or implied that Istari were ever apprentices — in fact, in all likelihood, Gandalf was a powerful spirit being that became a weaker being. The only time he demonstrates anything like learning new spells is after his reincarnation — and the difference between Grey and White may simply have been in an attitude shift caused by death and rebirth. The Istari were designed to give immortal council to mortals and to guide them; and indeed, an immortal being would in all likelihood be sagely. But linking their sageliness (that they have been around awhile) to their supernatural powers (which wholly stem from that they were created with that level of power) is a mistake; a connection is never implied. Its not irrelevant. D&D elves resemble LotR elves far, FAR more than the wizard vs wizard comparison, yet Gary has said many times that the only thing he actually took from LotR is that they dislike orcs (and who doesn’t?). Er, no we haven’t. At no point in the quoted interview he mention wizards, and I’m pretty sure everyone knows, by now, that D&D casters are based off of Jack Vance, hence, Vancian magic. D&D takes from a wide variety of inspiration, and Gary has said, many many times, that the inspiration from LotR is purely superficial. Right. You nonetheless, of course, are comparing him to various caster types, and starting the discussion using the fact that he doesn’t use Fly, Teleport, etc. (wizard spells, generally). First establishing that he’s not a very good wizard, and then making him out to be about comparable to a level 8 caster. Even by your very conservative estimation of Gandalf (and rating a balrog off of Gandalf instead of rating Gandalf off a balrog), I’m pretty sure a guy who can fling spells and fight for eight days straight is going to have no trouble against mobs of orcs, yet he is never portrayed as cleaning up large herds of orcs for the Fellowship while everyone relaxes in the shade. When he fights the Balrog, its an eight day laser light show; but the most he does against typical monsters is use Fire Seeds, once, four books ago. Wait, lets back up to the Two Trees and Ungoliant. Ignoring that Morgoth seems to take all damage as vile damage (or something) and thus for obvious reasons never fights unless he has to, I don’t think Two-Trees Morgoth really had time to weaken noticeably. Ungoliant, after sucking the Two Trees dry, is then powerful enough to challenge him. On the other hand, Gothmog (iirc) the balrog shows up to save him. We could say that Gothmog is only level 8 (or higher but still comparable to the Moria balrog, as he’s obviously strong by balrog standards either way), but it strains my suspension of disbelief to think that a sub-epic Morgoth is going to be able to go on to manufacture tons and tons of dragons and volcanic mountain ranges and what not. Point. I glanced over it; how would him creating dragons fit into those abilities? Exactly what you’d expect, personalities clash 1 on 1 and the guys that spew ridiculous amounts of fire burn everything down. The draconic claim to fame is flight and lots and lots of area effect fire, while balrogs handle individually potent adversaries. Yes… I would definitely expect a swarm of one comparable thing to do more than merely two comparable things? Not to mention that huge hordes of firebreathers facing off against tree-loving mooks is going to end in obvious tragedy. Not to mention that dragons improve and get better over time. The other important thing is that, if we assume Morgoth and balrogs are so emaciated in the power level department as you say, then dragons get completely crazy by comparison. There is a dragon that was so huge that, when it died, it collapsed an entire dwarven civilization underground. That’s quite beyond even a Colossal Red Dragon. Not to mention that, as you say, the dragons had a good chance of taking the Valar. I find it difficult to believe that total scrubs on par with level six elves are going to be able to create dragons that are hundreds of times their power level. Okay, How does the level 5-8 elf king thing square off, again? Morgoth (lv? )needs help vs Ungoliant (lv?) from Gothmog (lv8? ), and Gothmog later kills and is killed by the Elven King (lv5-8?). Morgoth doesn’t manage to harm Ungoliant at this point at all, so we can assume she’s at “full,” and this suggests that Ungoliant is grown to a power level over Morgoth even moreso than Morgoth was over Fingolfin. Gothmog (level 8, apparently) pretty much immediately drives Ungoliant off. That suggests Ungoliant was at least two levels below Gothmog, so she’d be about level 6. She herself whooped Morgoth, so he’s probably another two levels below her, which leaves us with a level 4 Morgoth. Gothmog and the Elven King (elite awesome heroes are, apparently, level 5-8, so ) are about evenly matched and kill each other. Meanwhile, Fingolfin would have to be about… level 1, tops, as Morgoth would be about as strong as your average troll — and that would have been way back before his diminishment. Of course, to your point buy system, you could simply add “Kryptonite: Vs Spiders” to Morgoth, “Kryptonite: Vs Balrogs” to Ungoliant, and “Kryptonite: Vs Elves” to Balrogs. Its especially bizarre to imagine that the great heroes of an immortal and magical but biological race would be judged by the same level standard as the best historical Earth heroes, when the latter only had one lifetime to improve, and the former can gain levels indefinitely. It is even more bizarre when the dragons vs Valar battle soundly demonstrates that magical and immortal, but biological creatures do grow over time — massively so — and can even become strong enough to take on Valar. Is the craftsmanship of Eru just that much suckier than that of Morgoth that dragons ramp up in power level with age and experience but elves can’t? And far too long for comments again, so it’s a new article-section at the other end of this Feanor-crafted LINK. @Jeremy: is it really critical to you at what level other people define the LotR and Silmarillion characters? You seem to have this vehemence against the author’s initial post about the Balrog because he has chosen a different benchmark than you would have. Unless you two are in the same game/campaign, I fail to see how that even matters to you. I happen to agree with Thoth’s points and arguments that LotR and all the attendant lore/stories are fairly “low magic” in terms of the Fantasy Genre as compared to other examples of Fantasy, and this is regardless of how you want to “class” the characters (i.e. what system). If you’re going to compare Tolkien’s writings to any other Fantasy writings and try to classify them accordingly, LotR characters will tend to be “less powerful”. if you’re doing an intra-LotR comparison of power with a ruleset, run wild and make Morgoth a level 100 whatever. if you’re comparing Morgoth to D&D however, none of his abilities displayed really place in him the power of anything more than moderately powered Devil/Demon. Magic and abilities in LotR are apples compared to the oranges of the D&D system, so it’s really hard to quantify them, but I think Thoth gave it a fair shake. You don’t agree and that’s really all you had to say on the subject. 1) I have reached a conclusion, decided that it was a good one, and it has gone unchallenged for weeks, months, or years. 2) Now it has been challenged – telling me both that I might be wrong and that I have failed to notice that for some time. 3) “Therefore the person challenging the conclusion is telling me that I am stupid and unobservant”. This a natural thought, but it’s generally quite wrong; it usually just means that “this topic is unimportant and rarely comes up, so the conclusion was never closely examined in the first place and has never been reviewed” – and it’s quite possible that the challenging conclusion is wrong. 4) Emotion now gets in the way; having decided that the the offending conclusion is a personal challenge, defenses are deployed instead of analysis. Rather than checking facts and examining the logic on both sides, poorly-remembered ideas are trotted out as “facts”, holes in arguments are overlooked, fallacies are used as “proof”, and increasingly-silly statements are made. There are a couple of ways it can go from there, but it most commonly winds up with the metaphorical equivalent of someone stomping out. That’s too bad because it’s a lot more interesting when someone presents some really good analysis – but I can’t change human behavior patterns. I am glad you found the article interesting; I analyze things for fun anyway, but it’s always good to know that someone liked the results. And Morgoth does degrade awfully fast in the Silmarillion – going from “second most powerful entity in the universe” to having to scream for his minions to save him from a big spider in less than ninety pages.